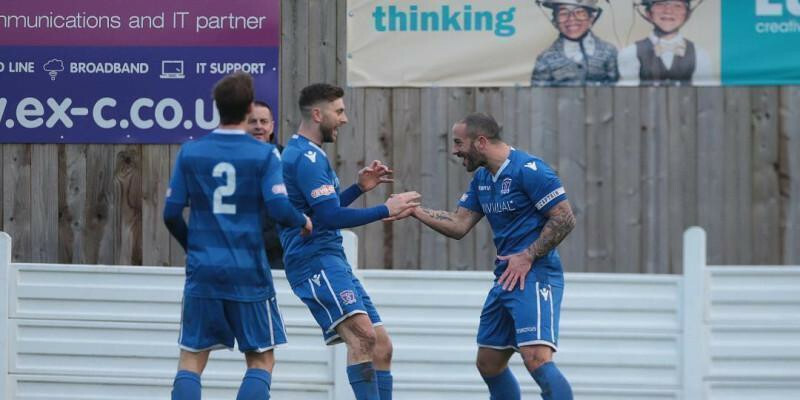 by Brian Davis (Media & Press Officer) For a 5th successive game, Supermarine were involved in a game finishing 2-1 (3 wins and 2 defeats) as goals from Stuart Fleetwood and Ryan Campbell and a solid defensive display saw them pick up a crucial three points. The visitors were denied an early lead when on loan Swindon Town ’keeper Will Henry did brilliantly to spread himself denying Tony Lee as he found space through the middle after only three minutes. From the resulting corner, Connor Thompson hacked a goalward effort off the line. In the eleventh minute, James Lea picked up a booking for a foul on Michael Hopkins and a minute later he saw his left foot effort fall just wide of Henry’s far post. After a quarter of an hour, Supermarine scored with their first attempt on goal when Conor McDonagh worked himself some space and sent over an inviting cross that Stuart Fleetwood tapped in from six-yards out. It quickly became two goals from two attempts when the right hand side proved fruitful for the home side once again. New signing Henry Spalding, playing on the right wing in place of the injured Brad Gray and making his second debut for the club after re-signing from Cirencester this week, skilfully got past a marker before sending McDonagh down to the byline. The striker then sent over another fantastic cross that the surging Ryan Campbell ran onto and volleyed home past Gosport keeper Pat O’Flaherty. It was another fantastic team goal and a fitting reward for some of the football played by the team this season. Five minutes later Gosport pulled a goal back as Lea cut back onto his left foot near the corner of the area and crossed for Tony Lee who twisted in mid air to volley home past Henry. Henry once again showed his football league quality when he spectacularly tipped a long range effort from Sam Lanahan over the bar at full stretch. It was a stunning save by the youngster who continues to shine between the sticks. Shortly before Half time, the woodwork denied Matt Williams extending the home sides lead when his header crashed back off the cross bar from Connor Thompson’s corner. Conor McDonagh was denied early in the second half by an excellent save by O’Flaherty and he later pounced on an O’Flaherty mistake as he robbed him outside the box, but a recovering Boro defender just managed to deflect his empty net goalward effort wide for a corner. Fleetwood continued his excellent run of form, causing no end of problems for the back four and he played creator for Campbell when skilfully getting past two defenders, dribbling into the box along the byline and pulled the ball back for Campbell who saw his fierce effort crash back off the bar. Campbell went close again when he hit a low effort just wide from substitute Joe Selman’s short corner. Selman was then fouled right on the edge of the D, but left back Hopkins couldn’t find the target with his freekick, curling an effort over the bar. Boro had two chances to equalise very late on, as Lee glanced a header just wide across the face of the goal, before a second effort was headed wide of Henry’s net.